Home AFP Campaign war against drug DOH Drug Against War Duterte Government News PNP Rehabilitaion Trending Numbers in the 6 months of Duterte's Government War Against Drug Campaign. Numbers in the 6 months of Duterte's Government War Against Drug Campaign. The president and it's government is taking hard against drug involved personality in the country. The time he sits to Palace, he is eager to come after drug's mastermind and it's sources. It is just a symbol that the president is true in his words to clean the Philippines to be a drug-free country. And it is also a sign of his love to his fellow country to save children and the future of the new generations. Even some are asking, how long the campaign on drugs will end, the president honestly answered that he didn't know that the extent of drugs and drug affected persons and areas are much considerable that a promise of 6 months to end drugs in the country during the campaign will be replaced by the statement until the last drug personality is killed. The Volume of Drug surrenderer in the country. 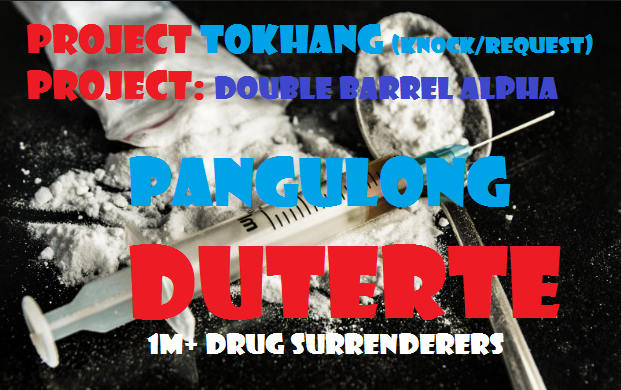 Phase II: Project: Double Barrel Alpha - operations against drug lords, rehabilitation of drug addicts or dependents, case investigations and the filing of cases before the courts, among others.